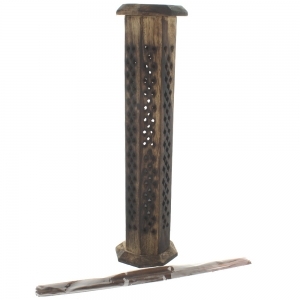 A lovely antiqued wooden incense tower (height 31cm). This incense tower is octagonal and features a carved design with cut outs to allow the smoke to drift gently out of the tower and around your room. Perfect for burning incense sticks and incense cones - simply lift off the incense tower and place your incense (can hold up to four sticks and/or 1 cone) in the base. Carved designs may vary - each one is unique. A pack of 10 sticks of incense is included.